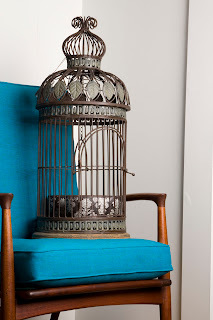 Oh, I have a feeling that anyone who loves Anna Spiro's decorating style is going to be a fan of Pip Robb's shop Armchair. 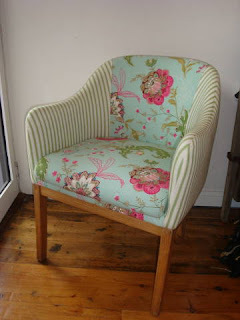 It's the way she beautifully matches eye-catching colourful fabrics with older pieces of furniture. You can visit the store in Sydney's Crows Nest or go online for a drool-fest. Pip also provides an interior design service, and don't be fooled by the name of the shop - she also sells sofas, lamps and other decorative pieces. How and why did you start Armchair? 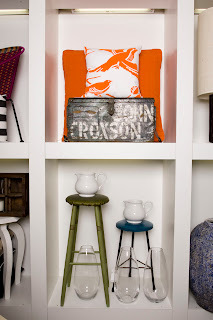 I started Armchair as I had always wanted my own interiors store as cliché as that may sound. I wanted a store that could reflect who I am and the things I love. I found it hard to source one off pieces, especially armchairs so I thought, I’ll open my own store. What’s been your best decision? Not to follow trends or colours just follow what I love. It’s easy to be swayed into buying things but I say to myself do I really love it? What has been a highlight? A highlight is seeing a customer walking in the street with an Armchair bag in hand, quite a strange feeling actually. Where do you look to for inspiration? Inspiration should come from everywhere. From your day to day life. My family, friends, fashion, magazines, food, colour trends, seasons, emotions, just life. I get inspiration all the time from so many different things. What are you passionate about? Chairs, to state the obvious. 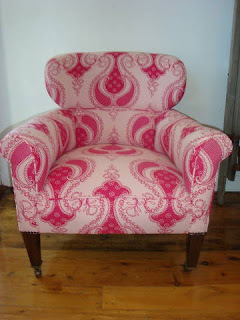 I love chairs, I love fabrics. I love the reaction people have to different types of chairs. I love that a chair can make me excited and make a difference to any room. What’s the best lesson you’ve learnt? Be open to advice. It’s the best way to learn and grow. What was your first job and what path have you taken since then? My very first job was in a chocolate shop! Apart from becoming a chocolate addict, it led me to furniture retailing, commercial design, freelance designing and now my beloved Armchair. If you could meet one person, living or dead, who would it be? It would be my grandfather who died in his fifties. Everyone who knew him respected him so highly and I would find it interesting to have known the husband of my late Granny whom I adored. What dream do you still want to fulfil? Armchair everywhere... ha, maybe I’ll start with Melbourne. It would be a dream to open a second Armchair in Melbourne in the near future. What are you reading? Women in Business. A boring answer for most, I know, but I find the stories really interesting.